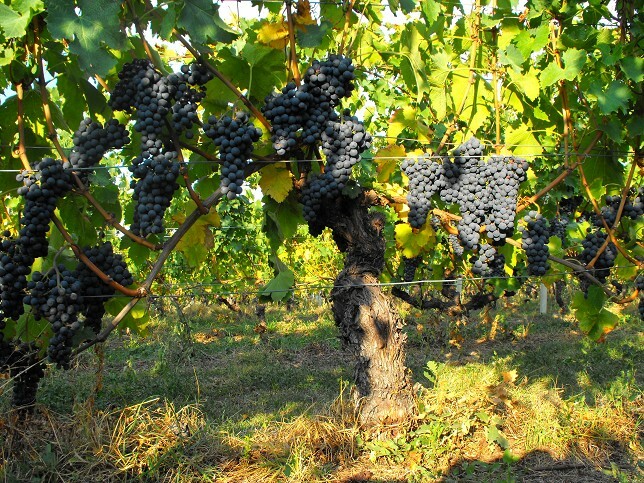 The Valle d’Aosta, Italy’s Beautiful Secret, Part 2 – GARGANTUAN WINE. This is the second article on Italy’s stunning Valle d’Aosta region. Here is the previous article on the La Kiuva co-op. This article explores the opposite of the co-op model: independent vigneron Vincent Grosjean. The Grosjean Brothers’ wines are like dark, knotted oaks; reticent with their charms, slow to grow, open, and reveal themselves. But once they are forthcoming, they count among the most compelling wines ever — and for prices that belie their quality. Vincent Grosjean in his cellar. Thanks to Vincent’s brother Eraldo Grosjean who is responsible for the upkeep of the vines, the house has been certified organic since 2010 — and Vincent has been using indigenous yeast to vinify for even longer, since 2004. Even if the La Kiuva co-op and Vincent Grosjean exploit the same varietals, the Grosjean wines are far more challenging wines which often prove severely reductive upon uncorking and insist on cellaring. When drinking young Grosjean reds, it can take two hours before the reduction “blows off” of his Gamay or Pinot Noir to reveal a wonderfully dark-fruited wine beneath. It’s tempting to confuse this reductive aroma with a whopping overdose of sulfur, but, as Vincent explains, he actually uses only a third of the amount of sulphur permitted1; it’s simply that the wines are bottled in such an oxygen-deprived environment that they gasp for air upon opening and need time. Aside from Vincent’s unflinching confidence that the Cornalin grape will be a big player in the Valle d’Aosta’s future, it was one of his anecdotes about Neal Rosenthal which marked me. Tasting with Vincent Grosjean at his cellar. It wasn’t until Neal Rosenthal stopped in to taste Vincent Grosjean’s wines for the first time that Vincent began to appreciate just how ageworthy many of his wines were. Rosenthal asked again and again: “And, do you have any older wine?” After he had tasted consistent quality and ageworthiness stretching across vintages, Rosenthal was convinced he needed to import the wine. Vincent’s wines are unique wines of character which could exist nowhere else in the world. In my tasting with Vincent, his Pinot Noirs were alluring, but it was his Torrette that stole my heart. Perhaps the most emblematic red of the Valle d’Aosta — a standard-bearer for quality in the region — is Torrette, a Valle d’Aosta DOC blend of at least 70% Petit Rouge, with the rest any amount of Picotendro (=Nebbiolo), Pinot Noir, Cornalin, Fumin, Gamay, Neyret, Vien de Nus, Dolcetto, or Prëmetta. Of the many unique grapes in the Valle d’Aosta that grow nowhere else in the world, Petit Rouge is the one I’m the most thrilled about drinking.3. Petit Rouge is the major grape in not only Torrette and Torrette Supérieur, but also in other Valle d’Aosta red blends from neighboring regions such as Chambave and Enfer d’Arvie; and of course Petit Rouge single varietal bottlings (see Anselmet for example). Petit rouge, sans herbicides, in the Grosjean vineyard. Petit Rouge retains a lean, snappy profile while delivering a dense level of spiciness, and it is never alcoholic or goopy. Jancis likes to characterize its flavors as red currant and spice in her biblical Grapes tome. Rustic yet elegant, and always ready to please, either alongside a meal or even on its own; never so severe as to insist on food, yet deftly able to handle nearly any wintry dish you might pair with it. Even if it is lamentably unheard of these days, Torrette was famous at the beginning of the 19th century4. I often wonder just how different this wine must have been before the advent of temperature-controlled fermentations in stainless steel. Both Torrette and Torrette Supérieur wines may be made, and some mysterious mixture of maximum yield, vineyard sites, and perhaps mandatory oak élevage account for the Supérieur status. Most other growers age their Supérieur wines in oak casks, but Vincent does not follow this convention with his Torrette Supérieur, which instead ages in concrete. Vincent finds this is the most traditional, authentic way to render the wine5. Color me puzzled6. Ultimately, however, neither Vincent’s lovely Torrette Supérieur nor his Torrette (which is done compleletly in stainless steel) need oak aging to be compelling. 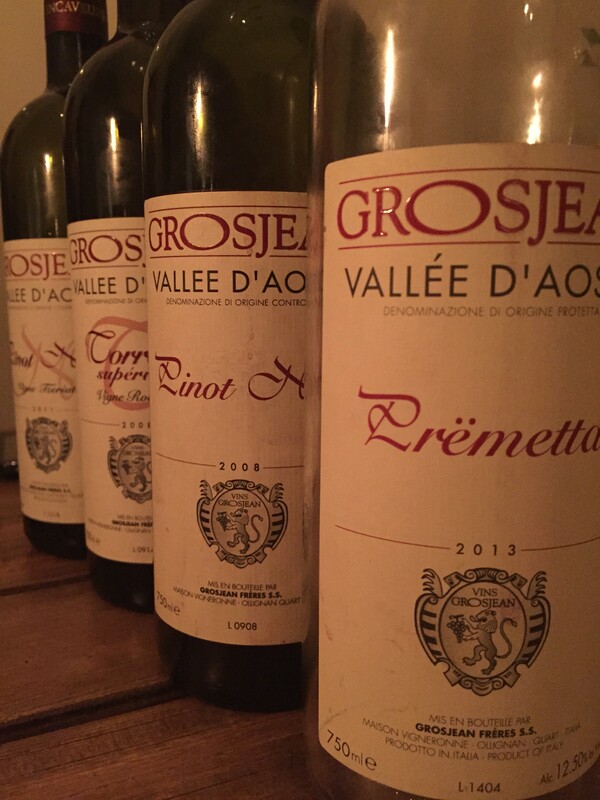 Some friends and I recently tasted a series of Grosjean wines over dinner. I couldn’t resist opening a 2012 La Kiuva Arnad-Montjovet later that night as well. Honestly, it’s a shame we didn’t get some Fontina cheese, an addictive cow’s milk cheese with a nutty taste that’s a classic pairing for the region’s wines, but aged examples can be among the most expensive Italian mountain cheeses out there besides bitto. With some slices of dried sausage for hors d’oeuvres, some broiled smoked pork chops, sautéed kale, and potatoes cooked in bacon fat (a variant of pommes Anna) — hearty, fatty, delicious mountain food, fit for the bitingly cold weather we’ve had recently in New York City — these wines were to have their word with us. The 2008 Grosjean Torrette Supérieur Vigne Rovettaz (75% Petit Rouge, 10% Fumin, 10% Cornalin, and 5% Prëmetta) had such a boisterous celery leaf character that it wasn’t until after a couple hours open that it allowed access a backdrop of Torrette sweet spiciness; a spiciness somehow vaguely similar to the La Kiuva Arnad Montjovet red, but cast in a much thicker, robust, more deeply-etched and earthy frame. I actually prefer Grosjean’s standard Torrette (done completely in stainless steel) to his Torrette Supérieur, and consider it the best representative of the Valle d’Aosta Central Valley, as it’s more of an alluring, immediately enchanting fruity spicebox. Even if it may not prove the more ageworthy of the two. Vincent makes other fantastic wines as well. The 2008 Grosjean Pinot Noir was a bit shy at first, but really unfurled with air, and boasted as silky of a texture as you would expect of a 6 year old Grosjean. It announced itself as an early contender for wine of the night. The 2011 Grosjean Pinot Noir Vigne Tzeriat was disarmingly fruity and offered itself surprisingly readily — atypical for a Grosjean wine, but perhaps 2011 vintage warmth is driving the fleshy fruit levels up here. These wines undergo an 18 month French oak élevage. A friend commented that, blind, he might have thought it was a a fine Oregon Pinot Noir; and as the night progressed and I revisited it, my perception of the fruit kept ramping up so drastically that I eventually agreed. A delicious, generous wine, which may seduce both domestic Pinot Noir drinkers and Old World palates. The wine of the night, though, was a total surprise. Each of us recalled a disappointing experience with previous vintages (2009, 2010) of Grosjean’s Prëmetta, a geeky rosé-like wine that is actually a red, and which actually ages into an orange-hued elixir7. Prëmetta is an antique variety that was only recently rediscovered and is typically blended with Petit Rouge (3-5% does the trick) to soften it. Grosjean’s production is a measly 1500 bottles. Lo and behold: the 2013 Grosjean Prëmetta is fantastic! Electric acidity, perky tiny red fruits, allusions to white flowers and a chalky core: this wine drinks itself, and defies its prescribed role as an hors d’oeuvre accompaniment. It doesn’t take much for me to pine for the Alps again, but these wines can do it via their nose alone — before even a single drop lights on my palate. Anything to be tasting wines with Vincent again, enjoying his achingly good local cheeses and charcuterie. And then, later, wandering through the grassy meadows about an hour due south in Cogné, in the Parc Gran Paradiso, with a belly full of delicious foods from the Hotel Bellevue restaurant, taking in the wildflowers and listening to the bells of grazing cows, all the while wondering just how great it must have been to be part of the royal House of Savoy, hunting for ibex and chamois in this Alpine wonderland which I could call my own. Before heading back home to Burgundy. Started drinking the petite arvigne 10 years ago… The reds unfortunately don’t make it to oregon much. Nice write up. Thank you.